California home sales volume continued to slow in the fourth quarter (Q4) of 2018, averaging 9% below a year earlier for the quarter. The annual price rise decreased quickly in 2018, from around 10% higher than a year earlier at the beginning of the year to just 5% by the end of 2018. Mortgage rates rose through much of 2018. 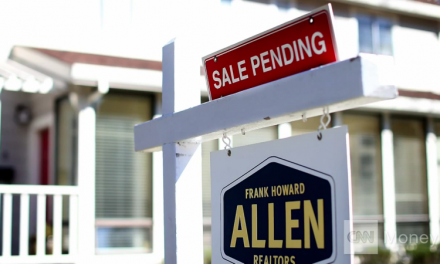 With the resultant decrease in buyer purchasing power, sales volume and pricing have felt downward pressure while homebuyers adjust to higher interest rates. The downward trend continues in 2019, as sales volume decelerates and year-over-year home prices will turn negative in the first half of the year, month-to-month prices already negative in Q4 2018. The decrease is expected to continue until prices bottom with the next recession, when homebuyers will return in greater numbers to take advantage of lower prices. Updated February 19, 2019. Original copy posted March 2014. Of these, home sales volume movement has the most direct impact on tomorrow’s home prices. The chart above tracks movement in home prices and the corresponding impact on home sales volume movement roughly nine months hence. 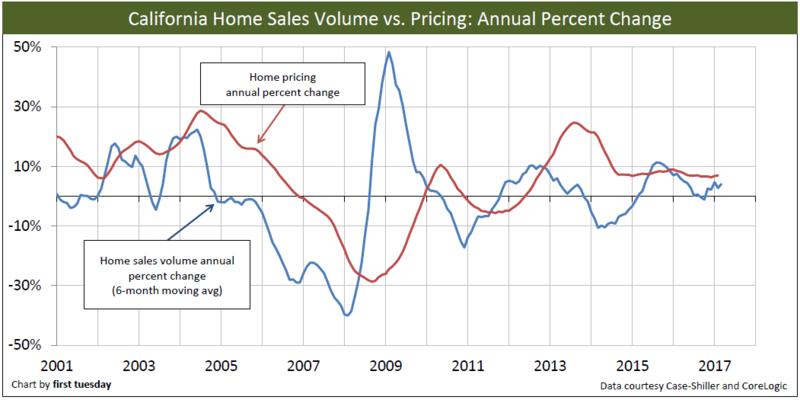 Movement in home sales is depicted in the chart above by plotting the percent change from one year to the next. We use a six-month moving average to smooth out month-to-month fluctuations caused by seasonal pressures. One important factor not displayed on the chart is rising fixed mortgage rates, which began in late-2016 and continued well into 2018. This interest rate action has pulled the home sales volume to trend downward. But, despite drastically slowing sales, prices have continued their upward trend, but are quickly decelerating. This is mostly due to excess demand, unmet by a shrinking for-sale inventory. The drawn-out recovery following the 2008 recession had many false starts over the past five years. First, 2009 saw home sales volume rise for the first time since peaking in 2004. However, the rise was artificially stimulated by the federal government’s first-time homebuyer tax subsidies. Real demand was not yet present, thus sales volume fell back in the following year. All the same, 2010 saw the first slight increase in home prices since the peak in 2005. Home sales volume fell in 2010, preceding the corresponding drop in home prices in 2011. Another rise and fall came in 2012, as speculators began their occupation of California’s housing market. By 2013, the housing market was dominated by speculators. 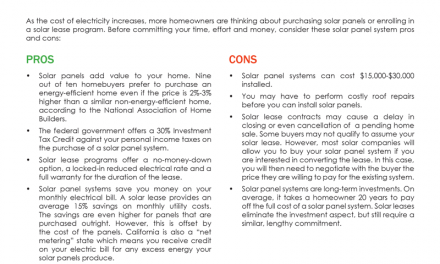 This caused home prices to rise without the support of home sales volume. Thus, as speculators continued their swift exit from the market in 2014, price increases leveled off and continue today at a 5% annual increase, and falling. 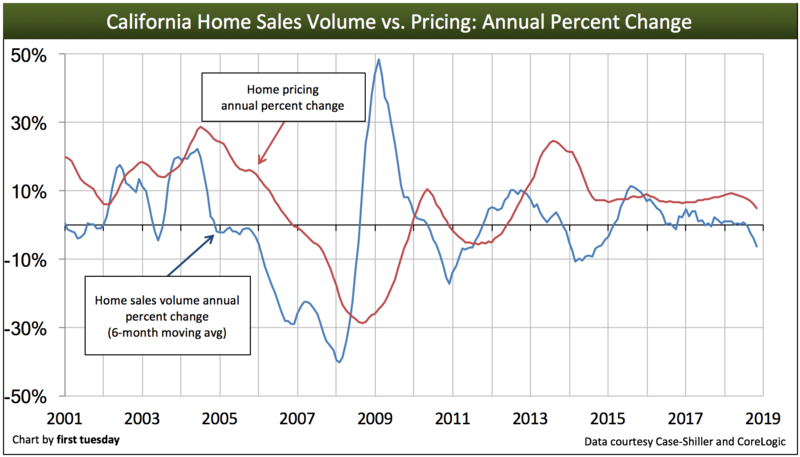 Home sales volume movement is a good way to predict home price movement. But it’s a mechanical correlation – the relationship between sales volume and prices doesn’t tell you how stable the respective changes are. To predict volume and price stability, you have to look at jobs. Since homeowners and renters require an income to make housing payments, California’s jobs market is a reflection of its housing market. Therefore, look to the jobs recovery for a recovery in home sales volume, followed by prices. Jobs finally returned to their pre-recession level in California in 2014. However, when accounting for population increases, jobs won’t reach a full recovery until much later, likely 2020, just in time for the next recession to arrive. Thank you for your question. We’ve posted a response to this question about inventory and home prices here: Does inventory set home prices? On the volume versus home prices question, in San Diego County volume has dipped but prices keep inching up. The reason appears to be that inventory is so low, and low enough to define the current market as a ‘seller’s’ market. Isn’t inventory (or said another way, ‘months of inventory’) a stronger indicator of price movement than volume?